As the week following Easter began, the forecast was for comfortable, warm temperatures and partly cloudy skies. There was little indication that an impressive lenticular formation would manifest for much of the day. This was easily the best formation that had developed since the middle of March. 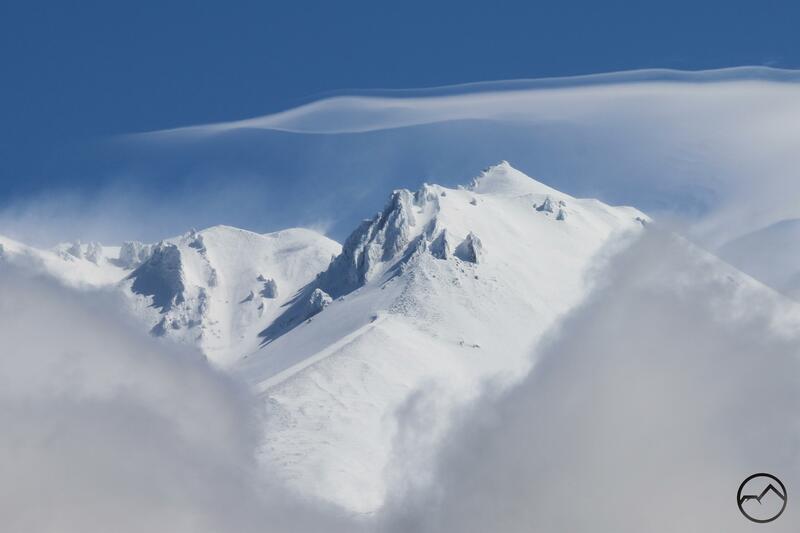 The way its shape was altered throughout the day is a good example of the drama and spectacle that these clouds add to the majesty of Mount Shasta. April has seemed to be fairly lenticular-free in the past but given the meteorological disturbances today, it was no surprise that an impressive specimen would make an appearance. Rather than another lengthy report, I think this cloud is best documented with images and some short descriptions. Hopefully this is not the only spring lenticular we get. When the lenticular began, I was exploring a remote, trail-less area on the lower flanks of Mount Shasta. With no hope of composing a good image from where I was, I documented the smiling cloud for posterity. Mount Shasta finally made an appearance as I fought through a lot of brush. At this point, the cloud had not changed much. When I reached more familiar terrain, the lenticular had formed a stack and then began to dissipate. The wind blew steadily. It seemed there was a good chance the cloud might reform. Around noon, the little lenticular had grown into a dense cluster of disks and waves. 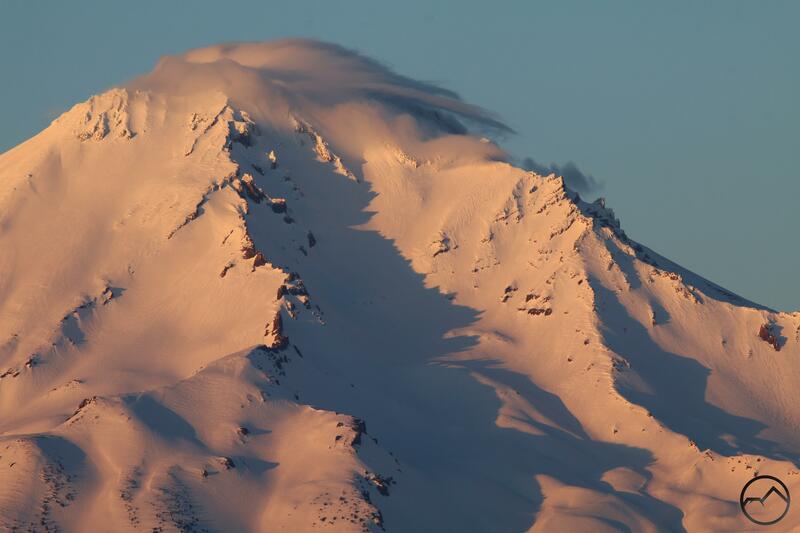 A second lenticular had formed on Mount Shasta itself, obscuring its summit. The mountain’s airspace was not the only place interesting clouds were forming. To the north there were numerous small clouds, all indicative of a great deal of turmoil in the atmosphere. By the afternoon the cluster of lenticular clouds had grown into a grand stack. Though it was in constant flux, the formation seemed stable. I had hopes through tower would translate to a grand sunset. The evening proved to be frustrating. The large stack had all but dissipated. 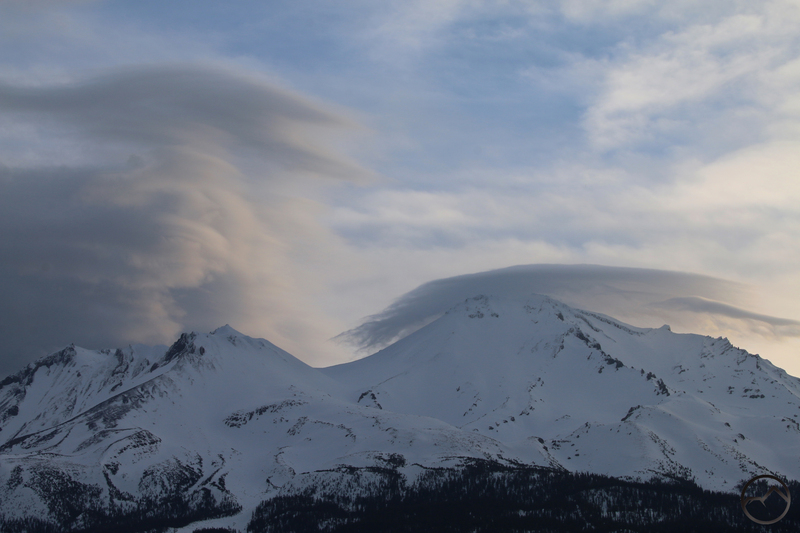 The lenticular on Mount Shasta itself persisted and a new disk had formed higher over the mountain. 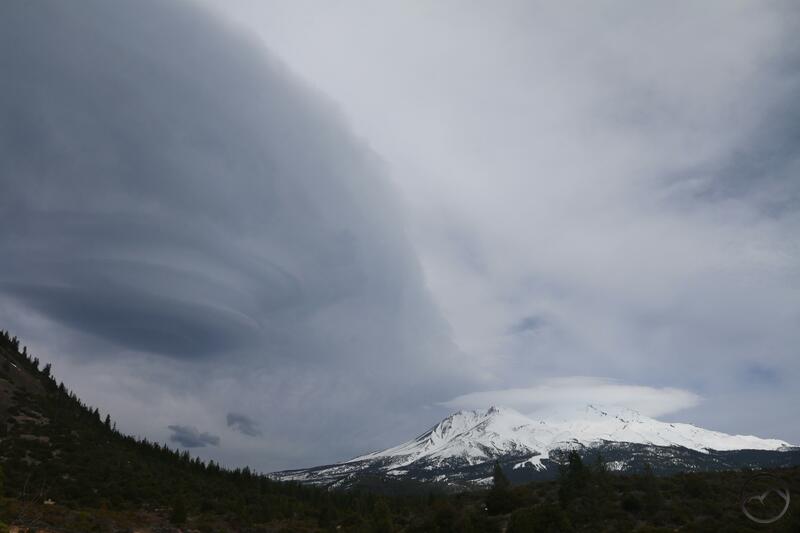 The lenticular on Mount Shasta itself seemed stable, giving little indication it too was about to retract. 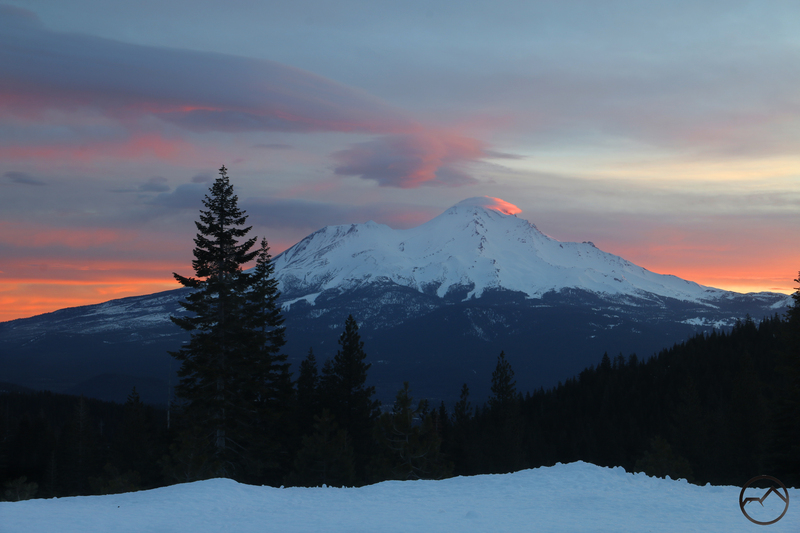 As the sun finally set, the lenticular on Mount Shasta was just vestigial. The light was odd, considering how clear it had been to the west. The day ended with a completely different cloud arrangement over Mount Shasta. It was not as grand as the earlier lenticular spectacle but it was a beautiful sunset nonethless. 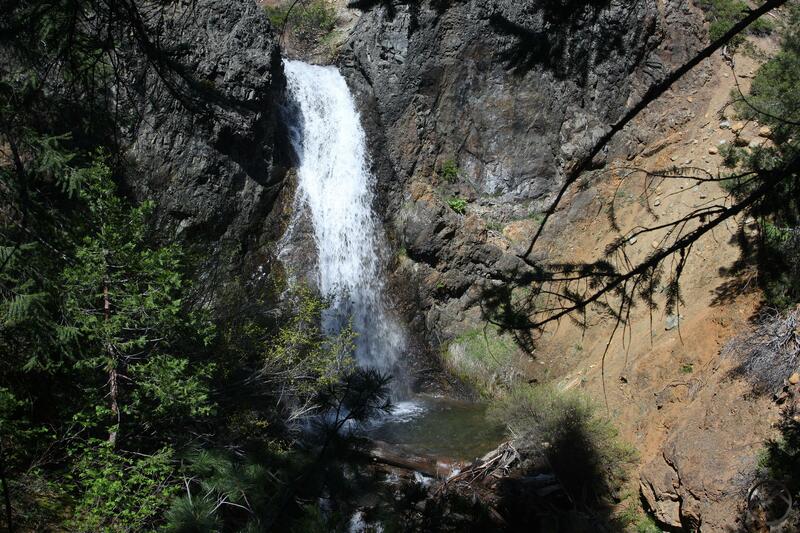 A spring waterfall somewhere in the Shasta Valley. Since I posted my collection of Mount Shasta area waterfalls, I have received a few questions about which ones, exactly, are best right now. Given that there is a fairly clear delineation between spring and summer waterfalls in Mount Shasta due to the great differences in elevation and watersheds, I figured it might be helpful to do a post on which ones are accessible right now. 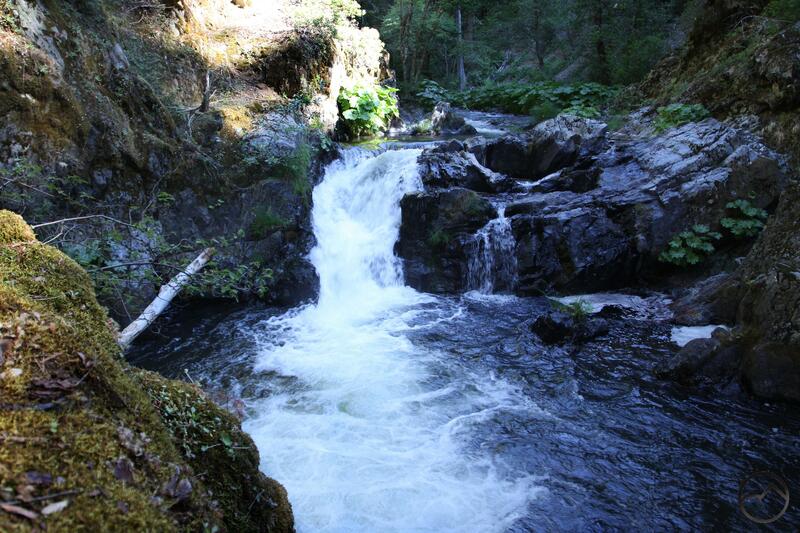 It may be worthwhile to do a post latter this summer of the waterfalls found at higher elevations too. 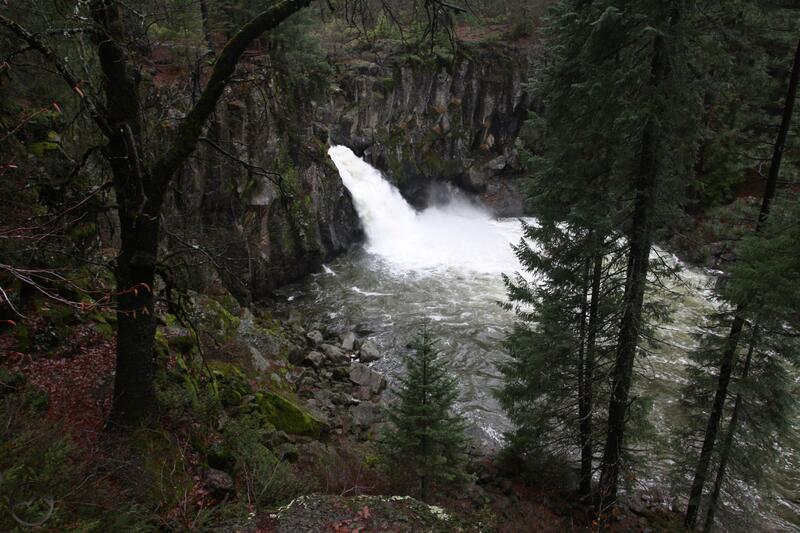 Nearly all the accessible waterfalls this time of year are going to be found in the Castle Crags or near the McCloud and Sacramento Rivers. This makes them accessible via paved roads without particularly long hikes. The falls in the Crags require the most involved hikes of the lot, though neither of these hikes are hard. Root Creek Falls is perhaps my favorite springtime waterfall. Nowhere else in the Mount Shasta area gives one the feel of Yosemite like the falls viewpoint. 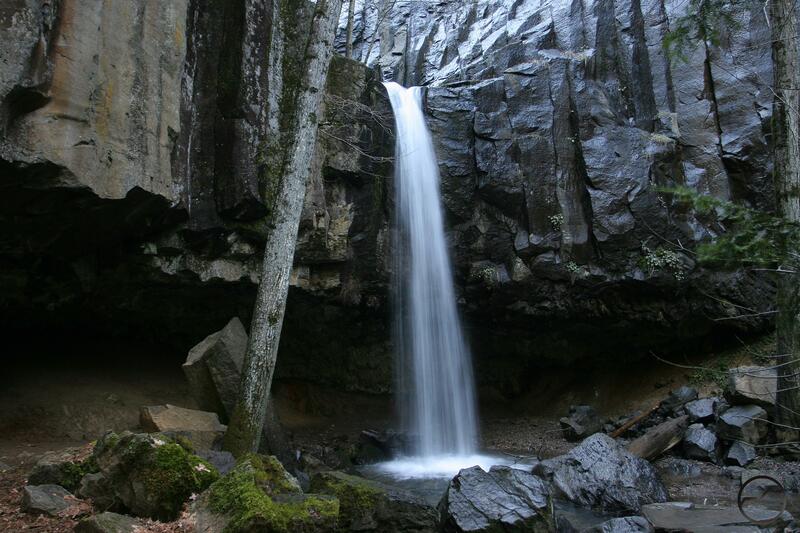 With granite cliffs, the soaring spire of Castle Dome and the multi-tiered plunges of the waterfall, it feels like sitting near the base of Snow Creek Falls in Tenaya Canyon. 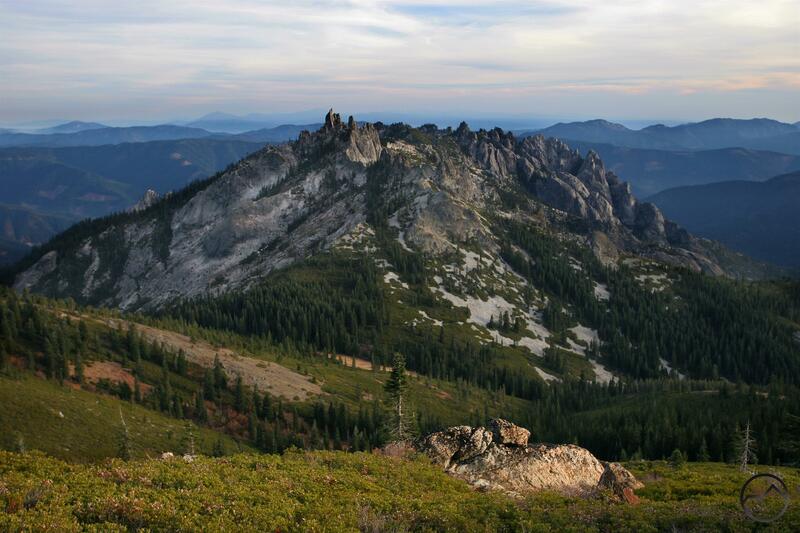 The Root Creek Trail can be accessed via the Soda Creek PCT trailhead or the Castle Dome trailhead. One of the smaller waterfalls on Burstarse Creek. 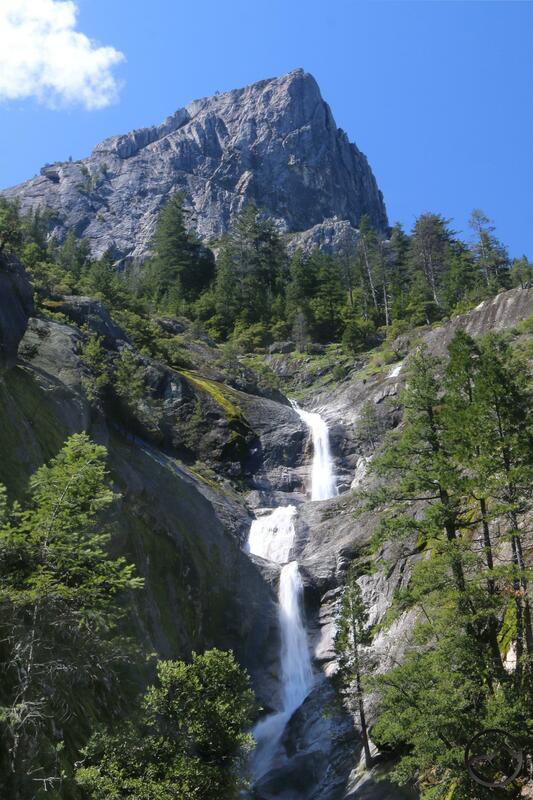 While Burstarse Falls is the obvious highlight of this part of the Castle Crags, getting there requires hiking past the lower falls and a pleasing succession of small waterfalls and cascades. Hours could be spent exploring and enjoying these memorable springtime cataracts. 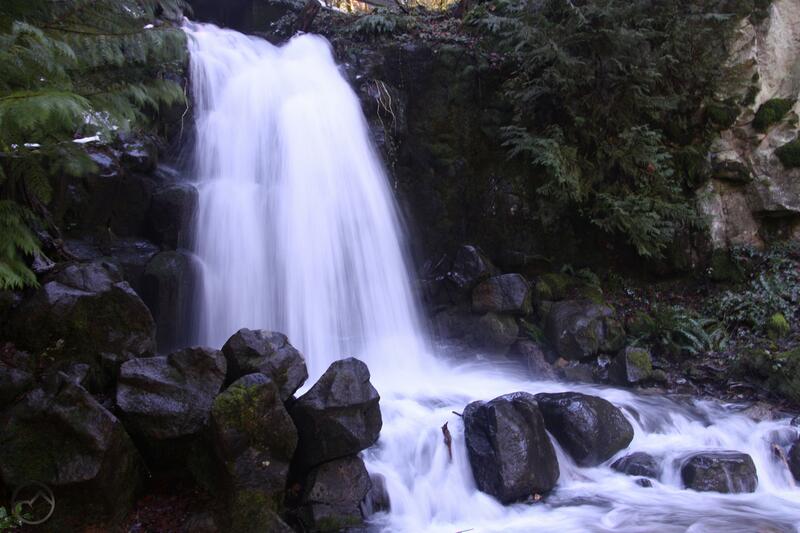 Burstarse Creek is easily accessed via a nice hike along the PCT. Faery Falls is a fantastic sight on Ney Springs Creek. Though having perennial flow, it is a furious torrent in the spring. The spring thaw elevates it from a pleasant little waterfall to a grand spectacle. The water pours through a narrow gap in the cliffs and then fans out over a 40 cliff. Easily reached by a short hike that passes through the ruins of the Ney Springs Resort. 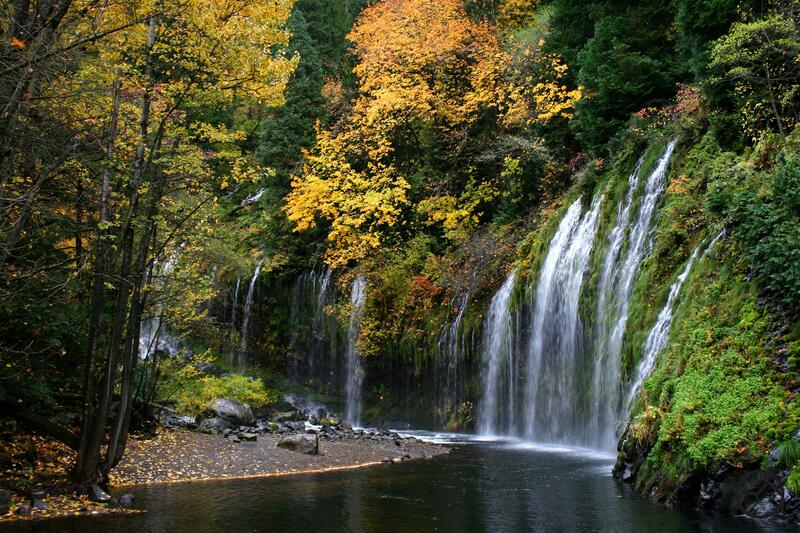 Hedge Creek Falls is a classic, easy-to-reach little waterfall right at the edge of the town of Dunsmuir. The most interesting feature of the waterfall is the columnar basalt over which it flows and the cave that lies behind it. 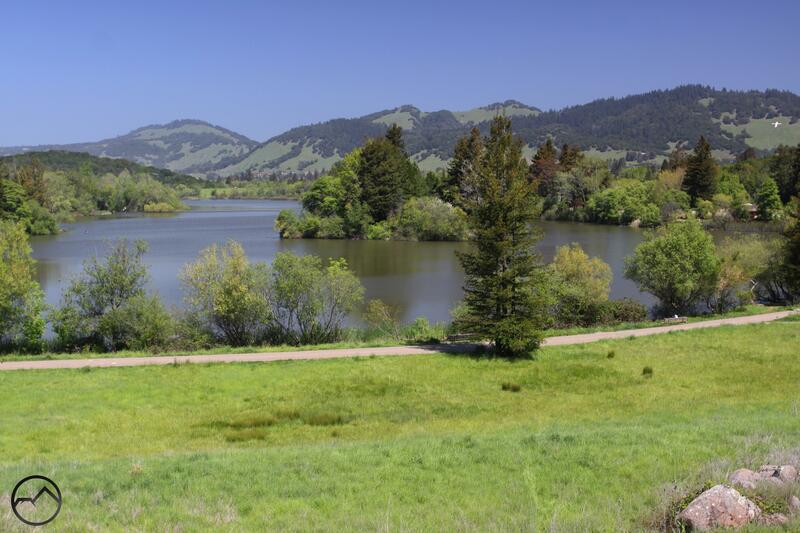 In the not too distant future this short hike will just be the beginning of the trail to nearby Mossbrae Falls. This latter waterfall has no legal access at this time but a trail will hopefully be completed this fall. 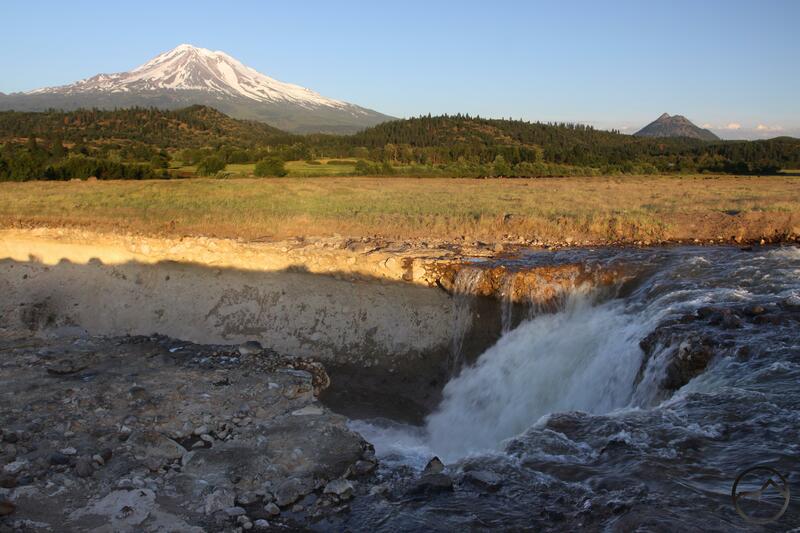 Get ready for this to be the most popular trail in the Mount Shasta area! 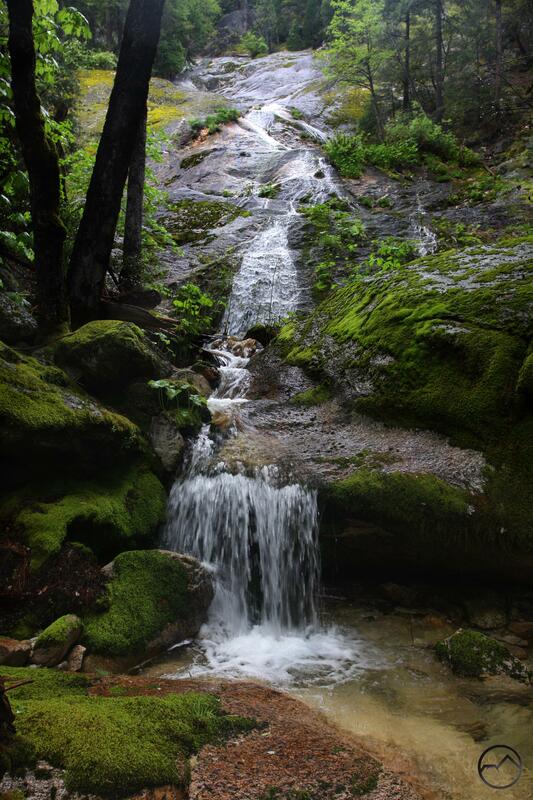 Located in the eponymously named community just south of Castella, this small waterfall is easy to access and worth a stop while hunting for waterfalls in the Mount Shasta area. It has a very short path leading right to the base. Not a particularly large waterfall, the cataract along Squaw Valley Creek still makes a worthwhile hike along the gorgeous creekside trail. This is not usually considered among the waterfalls in the area but ought to be. 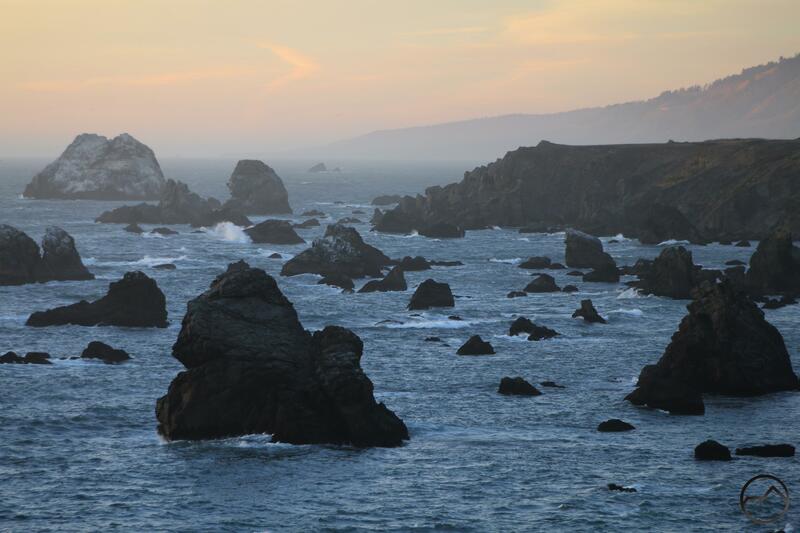 It is not flowing over boulders but a sharp precipice in the bedrock. Upper, Middle and Lower McCloud Falls need no introduction. 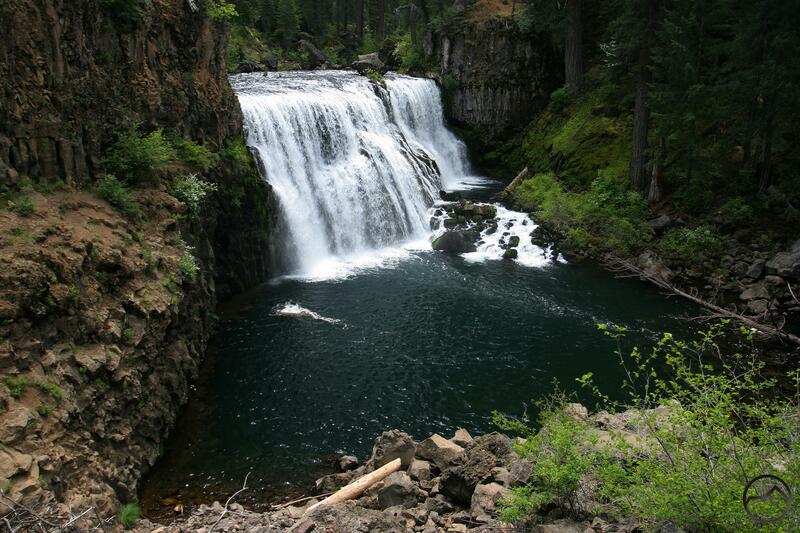 They are the premier waterfalls in the Mount Shasta area. While these obviously flow all year, spring is a great time to see them at the height of their power. Right now the road to the lower falls is clear of snow and the trail is open to the other two. 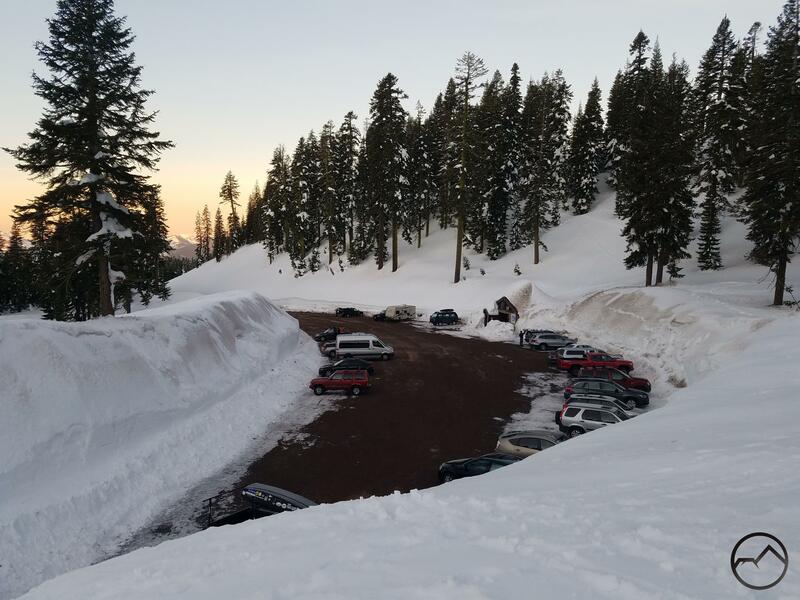 With the warm weather, all road access will be open soon. For those willing to get out and explore, there are a lot of other great, lesser known waterfalls accessible now. Many are in the Castle Crags, though there are some others scattered around the area. 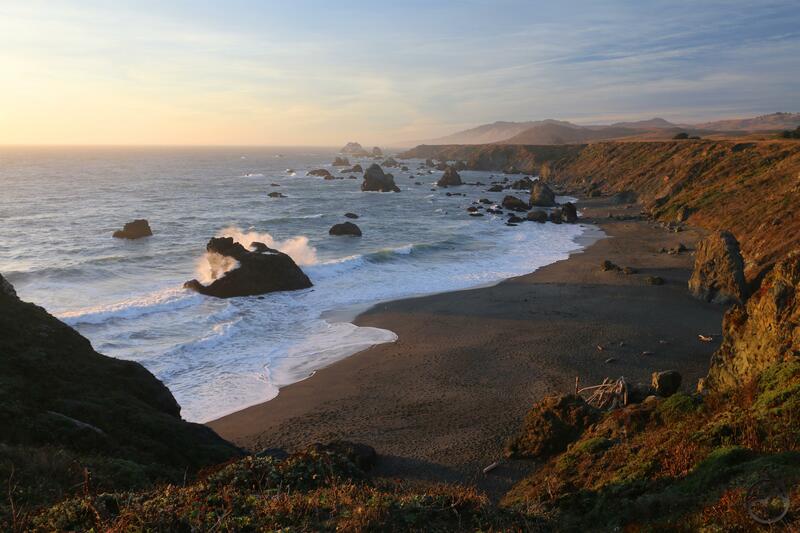 As the weather warms up, get ready to head out explore these natural riches! Even though the weather has been improving, it is still April and we will continue to have precipitation. Such is the case today, as the clear skies of the last couple days have gone for the moment. I got up early this morning and despite the overcast conditions, decided to head out and see how Mount Shasta looked. There was a nifty little lenticular above the mountain, akin to the currents I documented in my last post. I thought it might make a nice image if the light from the sunrise was low enough to come in under the thick clouds that covered the horizon. As the sun rises, there are times when the first rays of light, before the disk has broken the horizon that the sunlight passes beneath the clouds and are able to illuminate the mountain. When this happens, the light and accompanying color are fleeting but beautiful. Needless to say, this did not occur this morning. The overcast conditions were sufficient to filter almost all the color out of the morning light and I was left with a blue mountain. Only the slightest hint of rose was perceptible. 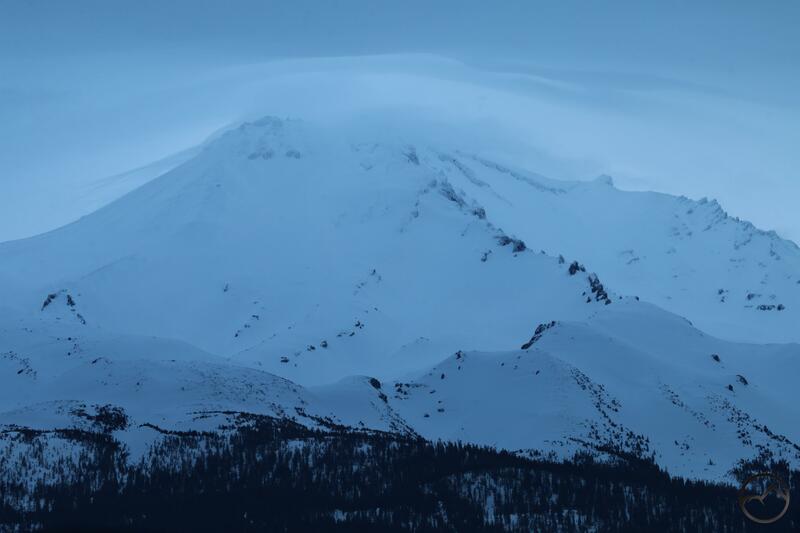 In spite of the monotone color, the little lenticular persisted, constantly changing, fluctuating and bending around the summit of Mount Shasta. I had set my camera up just in case the sunlight slipped under the clouds. That not having happened, I decided to leave my camera up to show a progression of the currents swirling around the summit of the mountain. 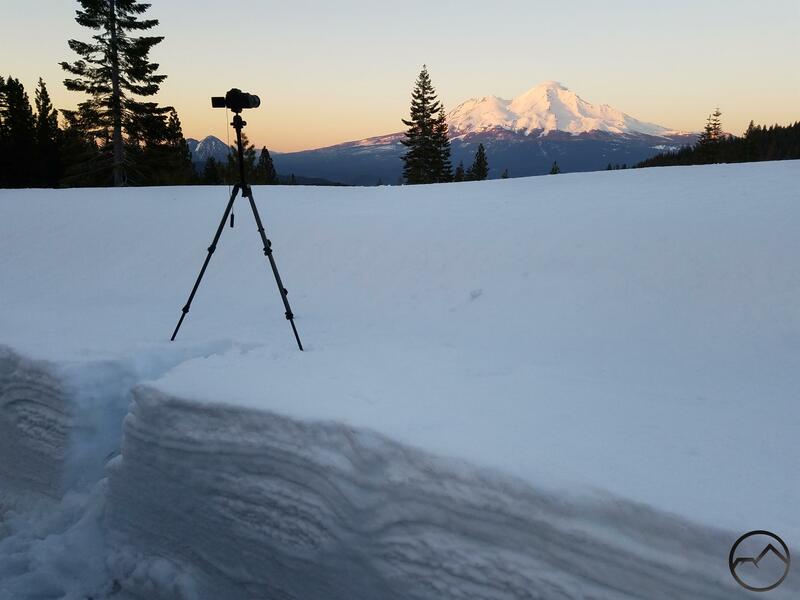 The time lapse represents about 5 minutes of activity around Mount Shasta. Spring is most definitely here. My lawn is finally turning green, temperatures in the low 70’s are coming at the end of the week. Spring hiking is in full swing. 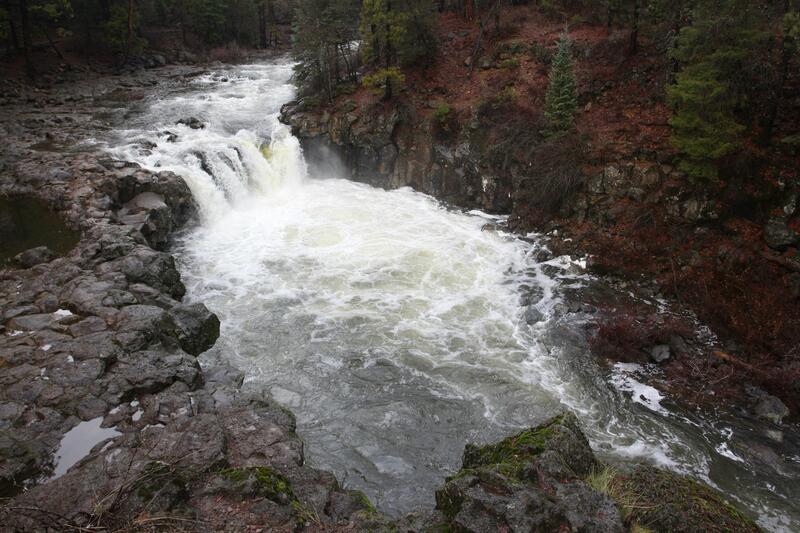 The area’s low-elevation waterfalls are booming. 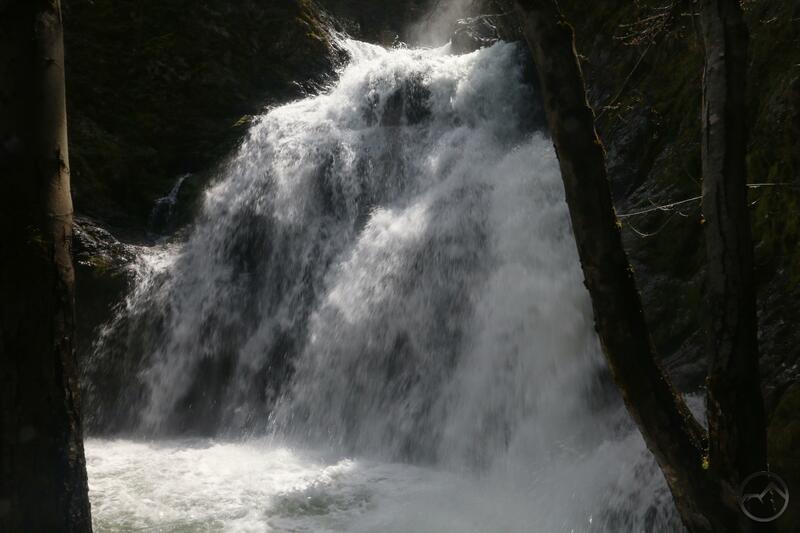 Root Creek Falls in particular is a great little hike with some powerful payoff right now. Get out and enjoy it! Yesterday morning I had to get up early to get my son to his Friday enrichment class. Normally the kids arrive at 8:30 but this time they were leaving their school at 7:00 to head down to Redding. That meant getting there around 6:45. My son and I are both early risers, so we were out the door with no trouble. However, the time he needed to be at school just about coincided with sunrise. Just to torment me, there was a very large, well-formed lenticular disk over the mountain and as it was in view, it was catching the morning light just before the sun broke the horizon. It was awesome. I, however, was steadfast and rather than stopping I proceeded to his school…only to get there before everyone else. In retrospect, I had plenty of time to stop and grab a great shot of the sunrise. Argh! I headed back out after dropping him off, this time to find that the clouds has totally closed in and the mountain was no longer even visible. I went north to the Shasta Valley, caught a great view of the lenticular, only to have it once again covered over by clouds before I was in a position to capture an image of it. Such is life. This time it was just not meant to be. Later in the morning I was out again and I was keeping an eye on the cloud. 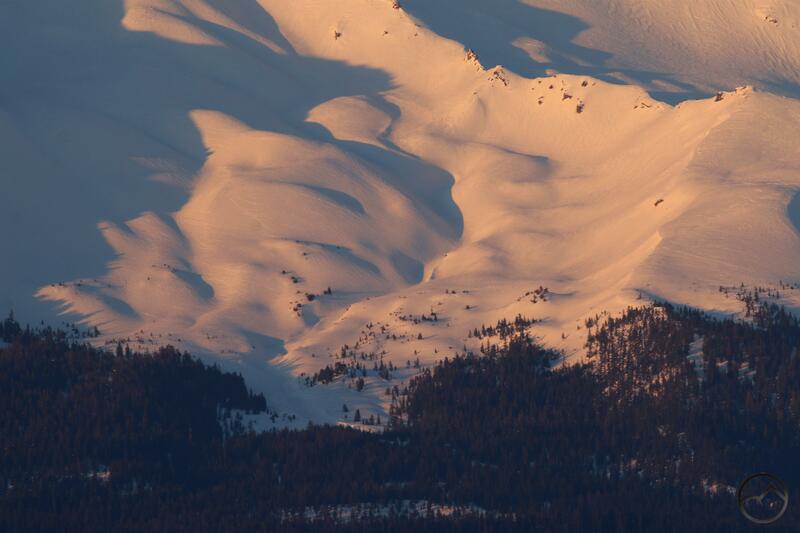 It had collapsed into some wispy tendrils just above Mount Shasta. I figured I ought to stop an get a few images of it, suspicious that it was doomed to dissipate altogether. As I did, the cloud continuously changed as the air currents flew past the mountain’s summit. While not the great cloud from sunrise, it had its own, delicate beauty. 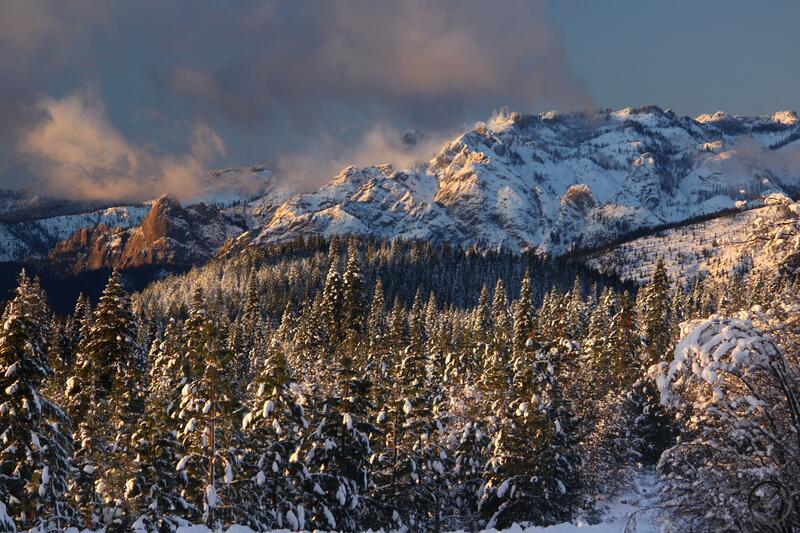 A winter view of the north side of the Castle Crags, lands newly accessible to the public. Last month I wrote an article detailing the significant land acquisitions in the Scott Mountains and the Trinity Divide. Click this link to read that account. 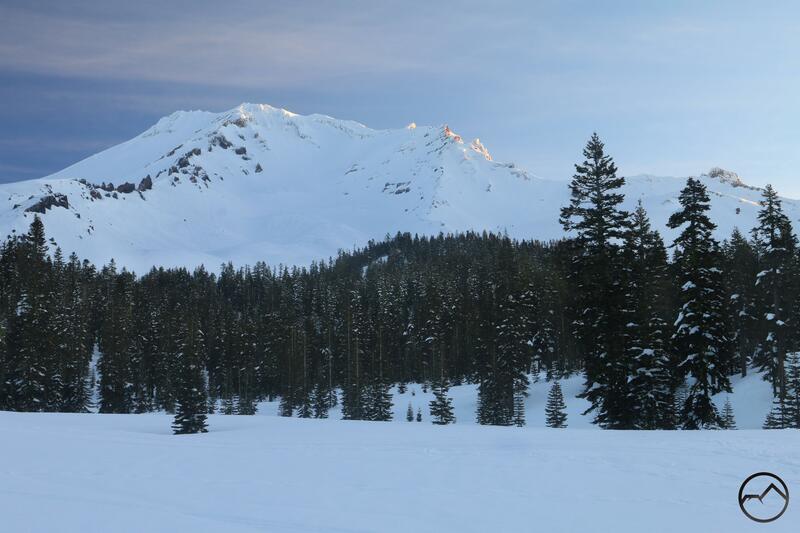 After I wrote it I remembered two other articles I had written in the very early days in the blog that reported new lands in the Mount Shasta area that were acquired by the Forest Service. Some of the lands, located on Mount Eddy, were included in the report on the Scott Mountains due to their proximity. The other area, in the Castle Crags, got a little less fanfare, though it could also have a significant positive impact for hikers in the region. Since these articles were written 6 years ago, I thought I would be worthwhile to dredge them up and raise a little awareness of the potential that remains for more spectacular trails and exploration. 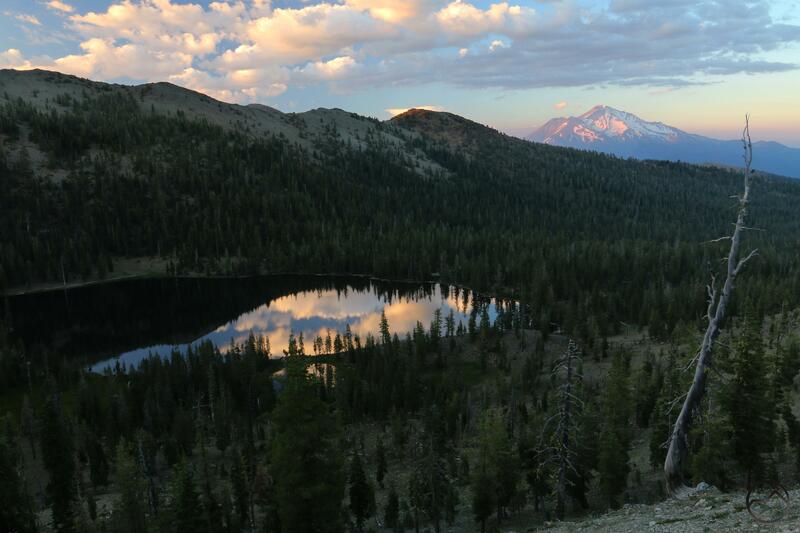 Sunset in a proposed Mount Eddy Wilderness. The first article focused on lands on Mount Eddy. 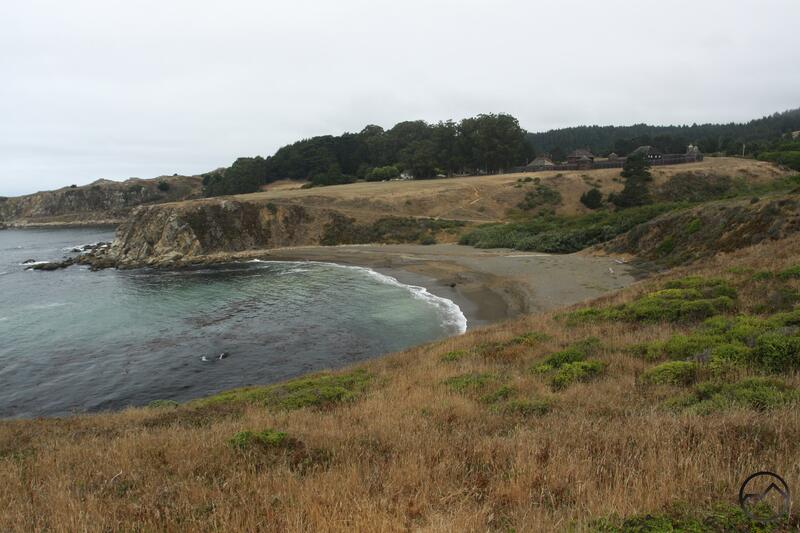 At the time, a pair of sections (a section is typically 1 square mile equaling 640 acres) were acquired and another pair, including one over-sized section were in negotiations. 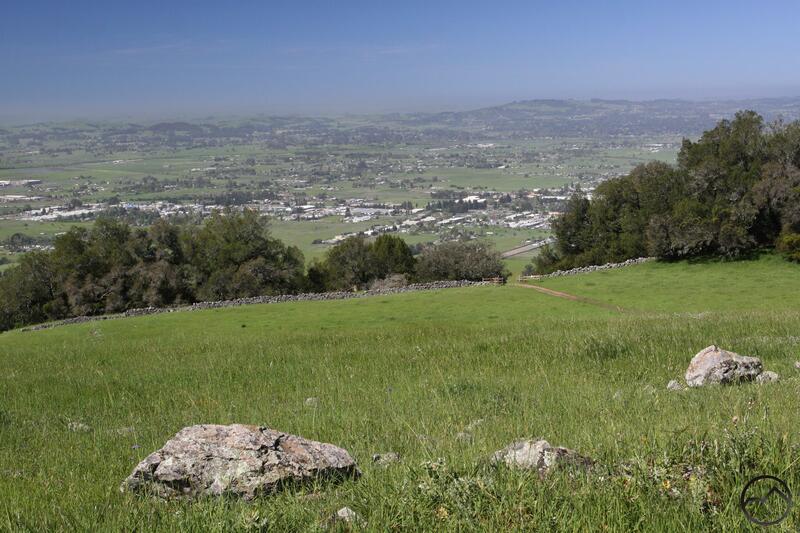 Adding land on Mount Eddy would have created a contiguous block of land where there had been a checkerboard pattern. 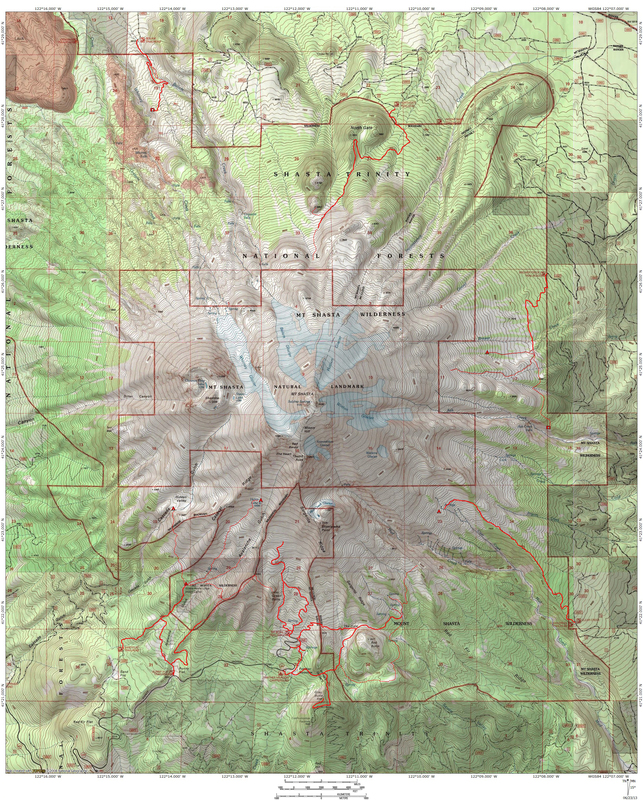 In my imagination (and I confess to being a bit of a visionary…with poor execution skills to make my imagination become reality) I thought this would be be a fantastic opportunity to create a Mount Eddy Wilderness. 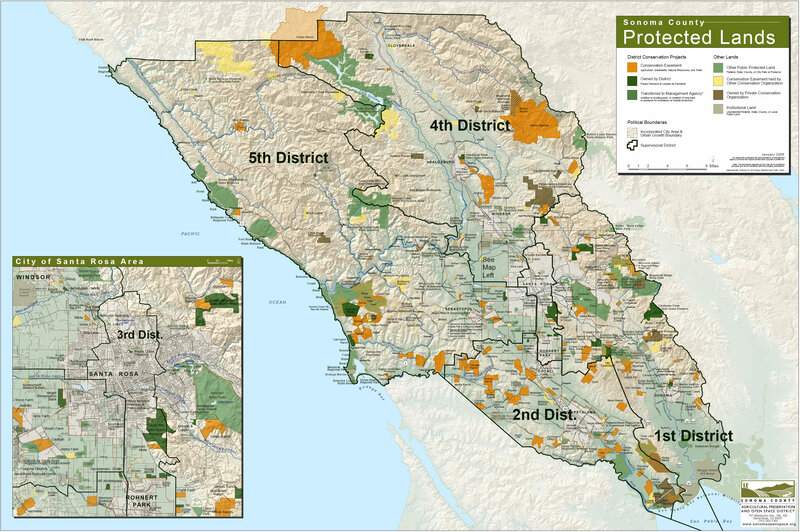 Though this particular designation is unlikely to occur, the area is likely to be managed as such anyway. 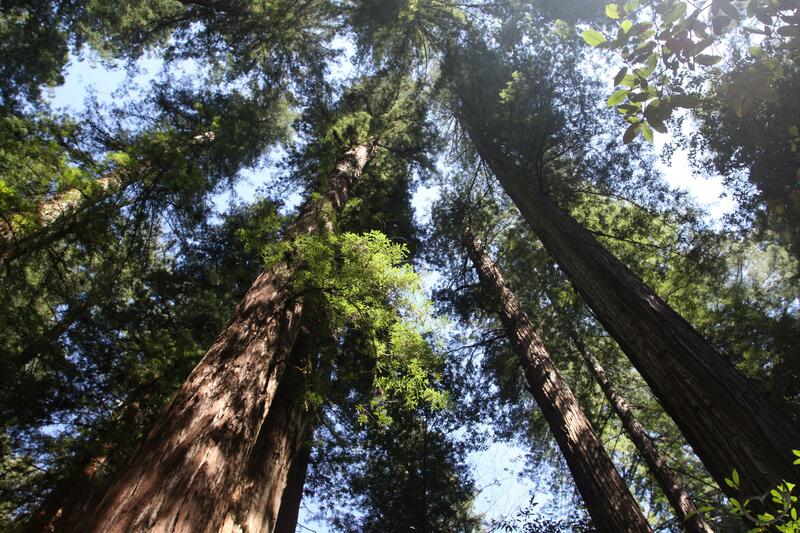 This means that recreation, particularly trail-based recreation will be the primary use, which is obviously a good thing for hikers. Though the wilderness area is unlikely, the reality surpassed my expectations in terms of lands acquired. 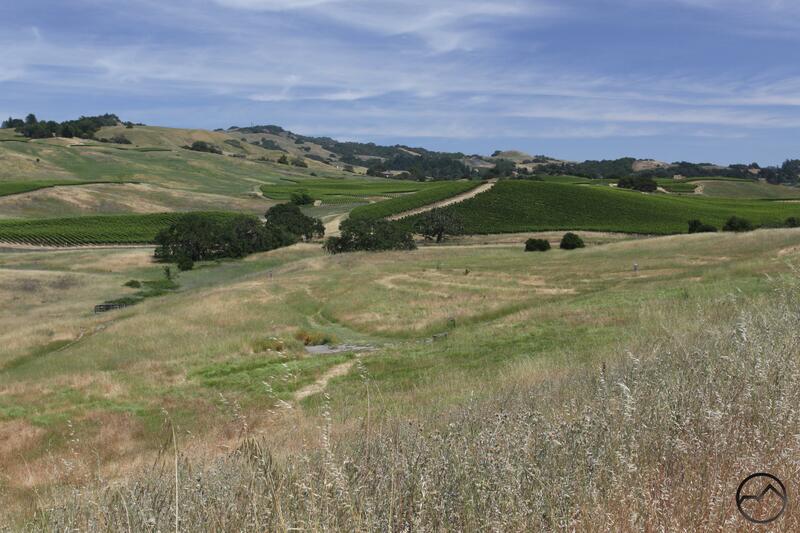 In the initial deal that I reported on, 2 other critical sections were acquired on the east side of Mount Eddy. 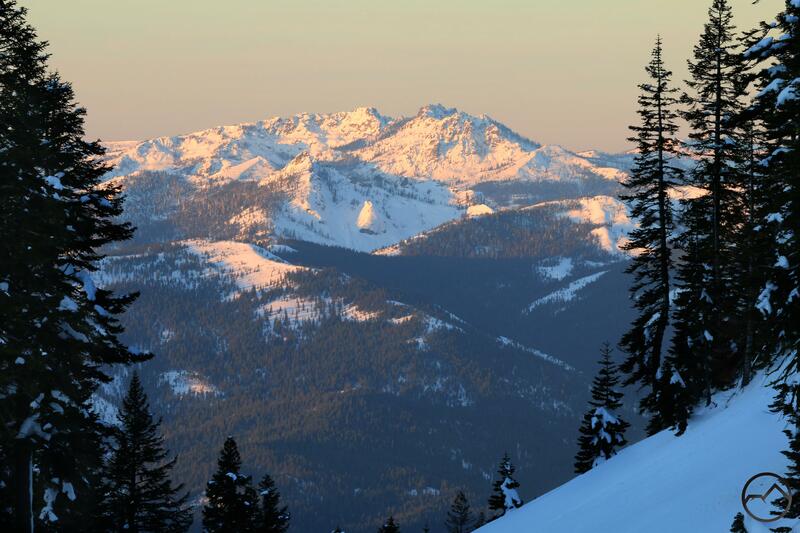 These are located in the gorgeous Eddy Bowl. Not only could these lands provide access to the frustratingly legally isolated Eddy Crater, Dobkins and Durney Lakes, but also to the Eddy Bowl itself. This large basin constitutes the headwaters of Wagon Creek, the first major tributary of the Sacramento River (this article offers good examples of Wagon Creek’s seldom seen beauty). 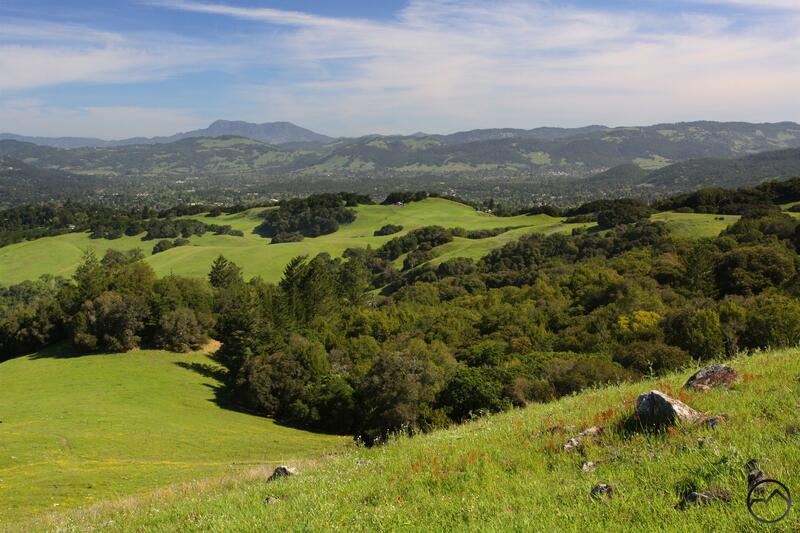 A future trail exploring this incredible area is an exciting prospect! The second article I wrote recounts and even more obscure land transaction that has not received a lot of fanfare. This acquisition is located down in the Castle Crags and brought to sections on the Crags’ north side under Forest Service administration. The transfer was only recently made official. These sections, formerly belonging to a timber company, include both the northern granite cliffs of the Castle Crags as well as nearly 2 miles of Little Castle Creek. The yellow section are the new lands. 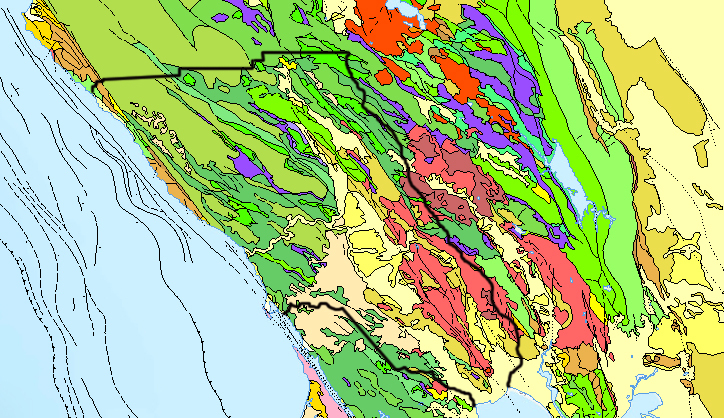 The red area is the Castle Crags Wilderness. 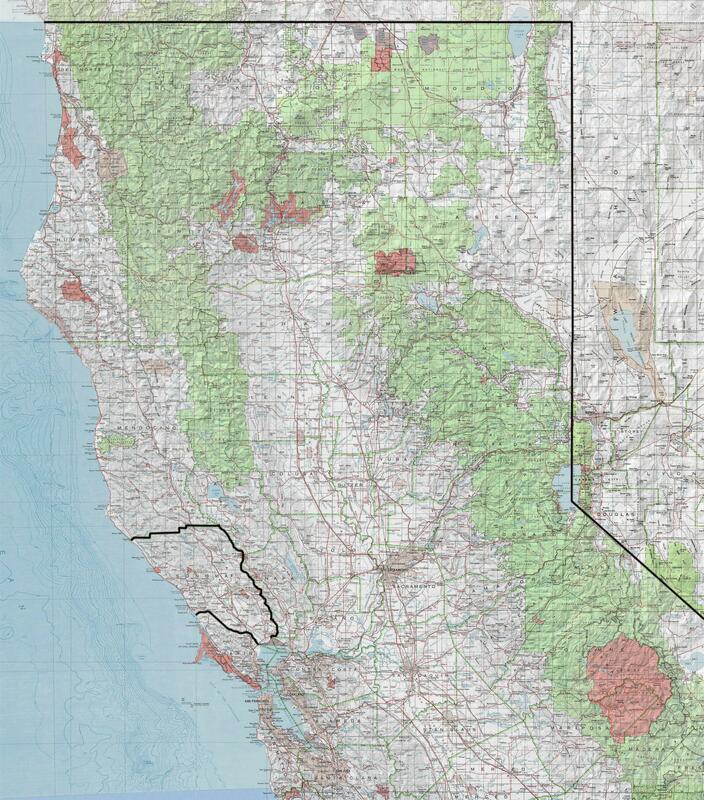 The blue areas are Castle Crags State Park. 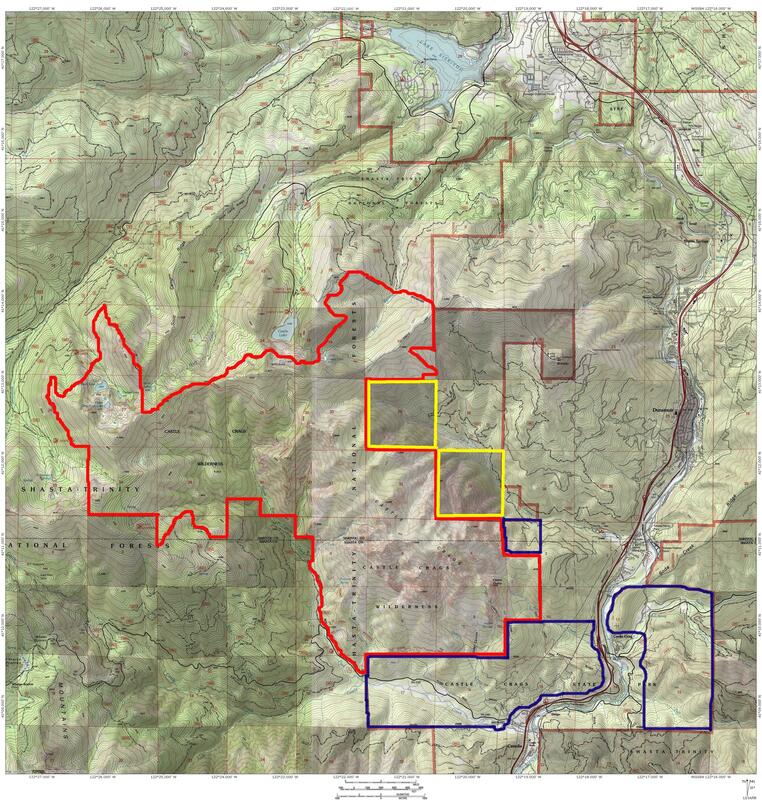 While these new sections are adjacent to the Castle Crags Wilderness, there inclusion in the protected area are unlikely, at least for the foreseeable future. Such designation requires and act of Congress, a process that takes a long time and effort. Perhaps that will happen in the future but in the meantime, the potential for recreation is terrific. A primary use of the land will be by rock climbers, who are naturally drawn to the towering granite cliffs of the Castle Crags. 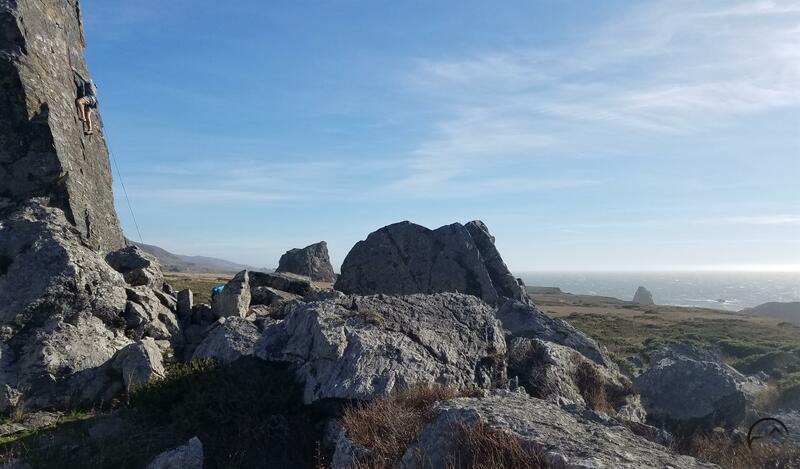 While there are already climbing routes to be found in that area, legal access and improved trails will undoubtedly bring more climbers to the Little Castle Creek side of the Crags. Looking down on the saddle at the head of Little Castle Creek. As far as trails, the most likely and desired addition will be a trail that ascends alongside Little Castle Creek. Discussions with members of the Forest Service indicate that a trail running parallel to the creek all the way up to the saddle at the west end of the Castle Crags is envisioned. This saddle, which lies at the headwaters of Little Castle Creek is traversed by the Pacific Crest Trail. A new trail leading down the creek would create new backpacking options and a the potential for a loop around the Castle Crags. The lands for such a loop already exist in the public domain and it would be relatively easy to connect a trail along Little Castle Creek to the Root Creek Falls Trail, thereby completely encircling the Castle Crags with trail. 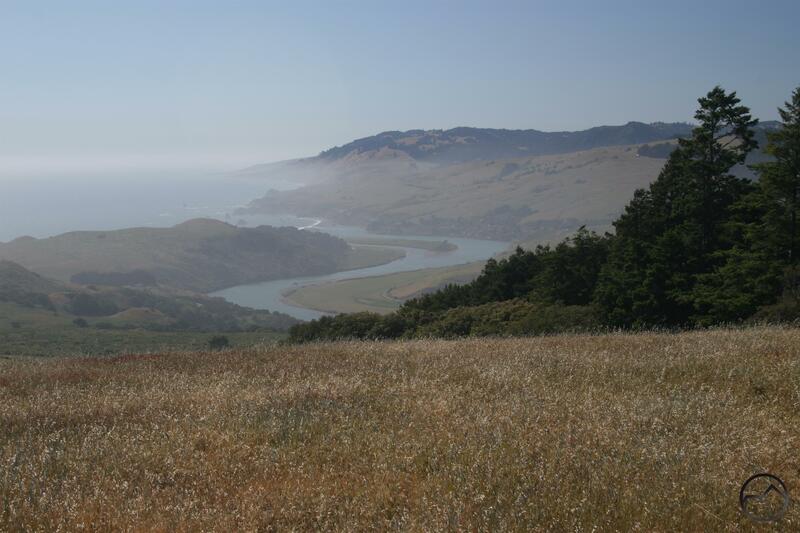 Whether looking for an easy creekside stroll or a demanding backpacking trip, it is hard not to be excited about the potential of the new lands here. These two new areas bring a lot of potential for hikers. The fact remains that, despite the wealth of trails we have in the Mount Shasta area, there is still a tremendous amount of untapped potential. Even more amazing, if much of that potential is developed with trails, there would still be a great deal of gorgeous mountain terrain for those who prefer to explore lands where no trails go. As someone who loves both of these endeavors, I am excited about what the future holds for this region! 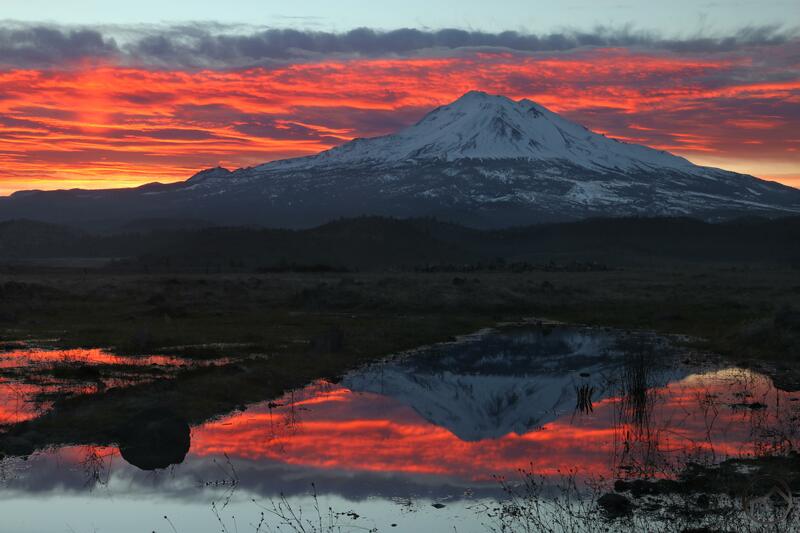 Sunset glow lights up Mount Shasta. February felt like a long, icy month in 2019 and the clouds and precipitation continued into March. However, as the natural order of things proceeds, the sky has cleared and the sun has begun to melt off all the snow. This meant that, after seemingly taking a few weeks off from getting up to watch sunrises, I could return to one of my favorite endeavors. The time spent watching the sun come up while much of the world sleeps always feels like a terrific investment. The sound of the wind, of water rushing, of creatures awakening is always rich and embellishes the spectacular scene of the sun coming up somewhere around the mountain. The snow is obviously deep but a path to the top has been cut in at the east end of the parking area. Despite being early in the morning, there was a fair amount of activity, as folks were preparing to head out onto the mountain for the day. I set up my camera and took in the scene as the sun came up. However, this time of year the sun is positioned in such a way that minimal sunlight actually hits the visible parts of the mountain. It was beautiful nonetheless. Looking to the south, I observed the Grey Rocks, one of my favorite peaks in the region. These, along with Battle Rock (aka Castle Spire) were lit brightly. This is an easy scene to catch but remains one of my favorites on the mountain. Satisfied with what I had witnessed, I headed home, ready to continue the rest of the day. The next morning, I got up early again but I could see a large network of clouds sailing south over Mount Shasta. Given their position, I knew that north with the direction to go in. I considered heading out towards the Shasta Big Springs Ranch off of A-12 but decided to not break my habit, opting instead for my favorite reflection puddle. I figured I needed to take advantage of it while I could, before the warmer, drier weather causes it to dry up. I am glad I went this route. It was a magnificent sunrise. Finally, Monday morning I decided to take another stab at Bunny Flat, but as the sun came up, there were no clouds whatsoever. Disappointed I headed down the mountain. However, at the unplowed entrance to the John Everitt Lookout, I decided to stop and see what I could see of the Trinity Divide to the west. Climbing up onto the high snow wall, I was glad I did. It was a beautiful perspective on the mountains and nice to see their snowy condition. Mount Eddy rises high above the other mountains. A closer look at Eddy Bowl. A great perspective on Black Butte. Looking northwest, toward China Mountain. Porcupine Peak and the Porcupine Lake basin. High peaks above the Gray Rock Lakes basin. Satisfied, I headed home once again. In the evening, my gracious wife released me to go play on the mountain once again. However, as I began the climb up to Bunny Flat, I quickly found the road gated just past McBride Springs. A sheriff and a couple of CHP vehicles blocked the road. From the officers I learned that there had been an avalanche about 30 minutes earlier that had partially covered the road. After the massive avalanche that occurred in February, this did not come entirely as a surprise, though it was intriguing. Undeterred, I shifted gears and instead headed up toward Castle Lake, the road having just been opened. I chose this spot because I reckoned it might give me a good perspective on the avalanche. Again using my telephoto lens, I scanned the mountain, but could see no avalanche signs other than the deep trough cut by the big one from February. It turned out to be a small avalanche on the large cut along the road, just below Bunny Flat. I stuck around for the sunset, which proved a little more interesting than I had anticipated. 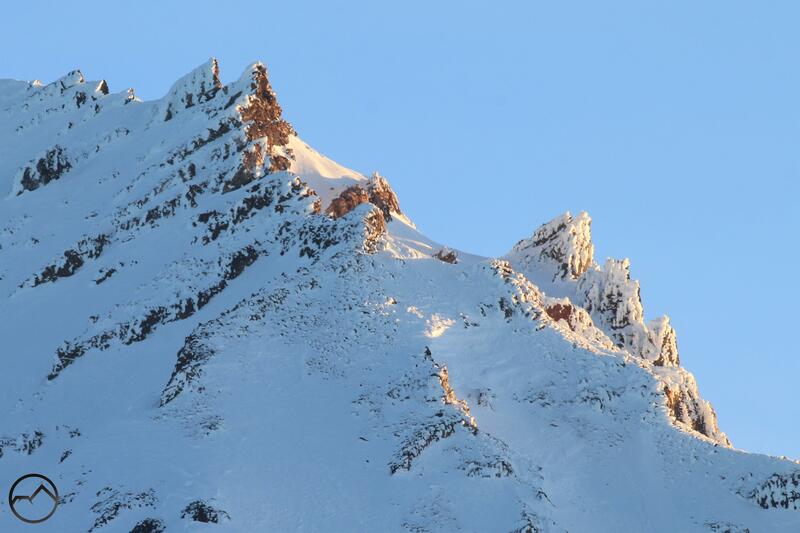 Though there were no clouds in the sky, there was one forming right on the mountain’s summit. Small satellite clouds swiftly formed and dissipated. The whole spectacle, coupled with the shrinking alpenglow, was an edifying sight. Despite more rain arriving soon, I can feel spring coming too. The temperatures are warming and the window for fresh snow is beginning to close. While I eagerly anticipate the spring and summer, their imminent arrival makes it easier to enjoy the snow while it is here. 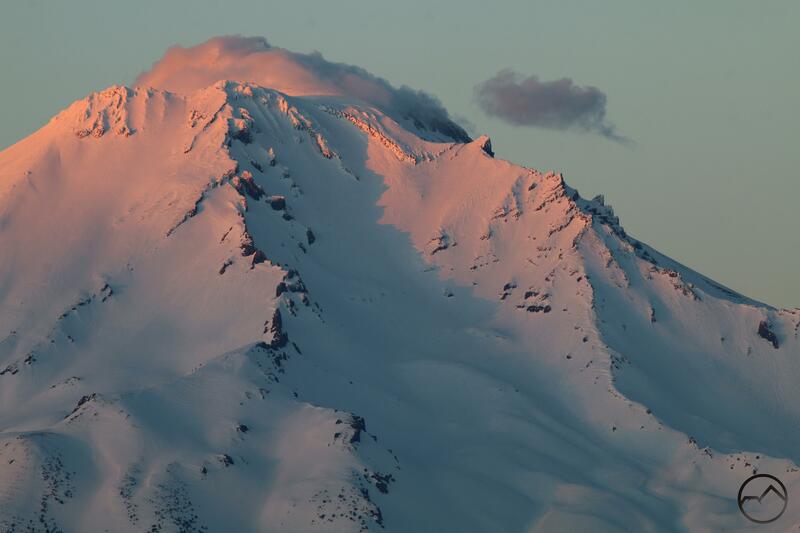 At this point, I am thankful for the opportunity to stand on a snowbank watching the alpenglow on Mount Shasta. Of course, after writing this post up, the very next sunrise was a beautiful one. It certainly deserves inclusion! Unfortunately, as is often the case with clouds like these, it ultimately morphed into overcast skies and is raining now. I am glad to have captured this one when I did!